This year saw the biggest contingent of marathoners from Striders to date at the Goald Coast Marathon ever, and an impressive 6 debutantes. We were also represented in the Half Marathon by Sandy Scott with a 1:48 PB and Pamela Murch running a scorching 1:36 to record one of the fastest times of any Strider this year. Her time certainly puts her in the box seat for annual Half marathon award yet again. Our marathon debutantes were Duncan Price , Michael Stark, Abi Griffin, Paul Dack and Emma Chandler. Also competing were Mary Jackson, Jenny Cawood and John Brown. The debutantes had prepared since January and most had to negotiate the usual hurdles of injury, illness and the normal interruptions of life (life often gets in the way of running doesn’t it?). Paul Dack had a faultless preparation that included a sizzling 1:29 at Noosa Half. Paul ran perfect 5km’s splits at 22min until the 35min mark and then cramps hit him hard and he struggled home after an otherwise magnificent run. He crossed the line in 1:29 for an impressive (if not painful) debut. Next across the line was Michael Stark who missed out on the run last year due to injury. A bike fall two weeks out caused some concern but he shook that off for an excellent debut at 3:35. Starkie is our tallest runner and the marathon is typically a huge ask for big guys but he’s pulled it off. Since the start of the season when Duncan Price crossed the finish line of the Twilight Half there’s been a lot of jabber heading Starkie’s way about being beaten by the light-footed copper who then reprised his act at Noosa. Duncan got the flu during his taper and his preparations were thrown into disarray before the race. He toughed it out and crossed in 3:53, giving the ascendancy back to Starkie who must be complimented on his lack of sledging. Starkie said “I didn’t worry too much about the Half marathons because I’ve always thought the true test of a man is the marathon.” Jerrod made another excellent debut at 3:41 and has shown that apart from being a much fitter and better-prepared runner he has nailed the headspace dimension and was able to stay in the hurt locker for as long as he needed to. Abi Griffin had numerous injuries during her marathon training and ran with Emma until the 35km and stormed home for a brilliant debut of 3:49. Jenny Cawood clocked up yet another marathon with an excellent time of 3:55. Emma Chandler had a tough day at the office feeling a bit sick but also toughed it out and made a great debut at 3:59. Emma combines being a working mother of four children along with lots of gym, cycling and run training. Mary Jackson yet again chaperoned another runner to their first ever marathon and finished in 4:26. John Brown ran what I think is his first marathon in 5:22. I think all the debutantes learned that the marathon is a different beast from shorter races, especially the Half. Runners who posted very fast times at the Half were unable to match that equivalent time in the marathon due to the X-factors of cramp, dehydration and fatigue. The marathon is a respecter of nobody, and it must be approached with the knowledge that it can throw up some challenging physiological and mental challenges that you otherwise don’t experience in training or racing at shorter distances. Mary suggested that runners do at least one of their long training runs at the same time as the marathon (instead of at 5am when it is cooler) and this proved to be very wise advice. Runners suffered from the higher temperatures. The golden rule of nutrition is that you don’t consume anything on race morning that you haven’t done in training. This leads to unforeseen issues and this proved to be the case. Coping with cramp is a complex issue, and there is no easy answer. The more marathons you do the better your legs cope, with smarter training and perhaps better pacing and also a more thorough hydration and nutrition plan for the run. Having said the above, every marathon finish is a major success, and puts you in the top percentile of the population. The many months of training required lots of difficult balancing and juggling with time and other important commitments and the training sessions themselves required dedications. The runners can rightly feel immensely proud of their achievements. 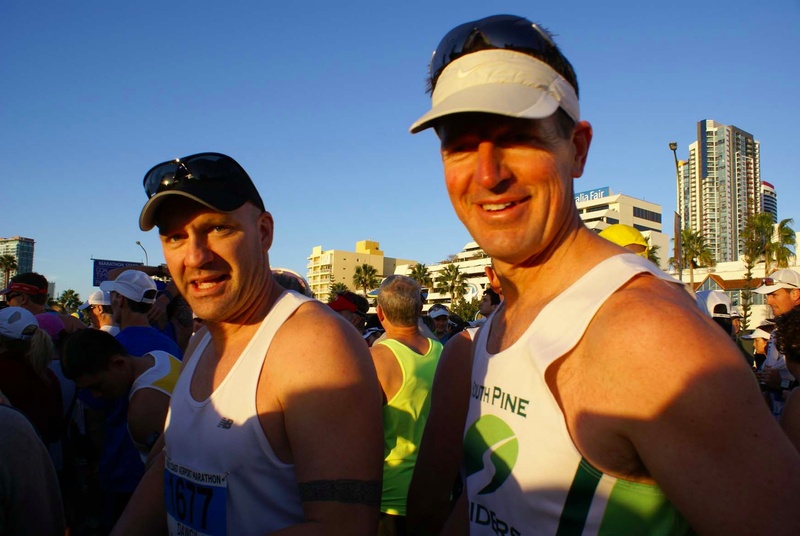 I missed out on Gold Coast due to injuries but I am hoping to give the Brissy marathon a good shake on August 1.